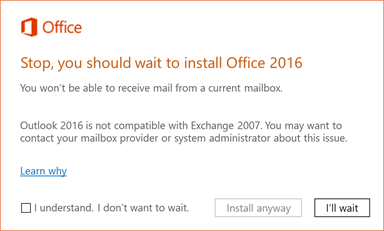 Stop, you should wait to install Office 2016. You won’t be able to receive mail from a current mailbox. Outlook 2016 is not compatible with Exchange 2007. You may want to contact your mailbox provider or system administrator about this issue. The resource that you are trying to use is located on an unsupported version of Microsoft Exchange. Contact your e-mail administrator for assistance. Then, when you open Outlook, you get another error message telling you Outlook can't open your data files. Cannot expand the folder. The set of folders cannot be opened. Network problems are preventing connection to Microsoft Exchange. These errors occur because Outlook 2016 for Windows doesn't support connections to Exchange Server 2007 and earlier. Uninstall Outlook 2016 and then reinstall Outlook 2013 on your PC, if you upgraded to Office 2016 from an Office 365 subscription. Uninstall Office 2016 and reinstall Office 2013 Home and Business, Office 2013 Professional, or Outlook 2016 for Windows standalone if you previously had one of these earlier versions of Office on your PC. For more information, see How do I reinstall Office 2013 after an Office 2016 upgrade? You can also contact your Internet Service Provider (ISP) or company email server administrator about your email account to ask them if they plan to upgrade their Exchange Server to a newer version. If so, and after the Exchange upgrade, you can reinstall Outlook 2016 for Windows. Tip: If you have multiple Outlook email accounts, and one of the accounts (that isn't your primary account) is connected to an older Exchange server, you may want to remove it from Outlook to avoid these errors and use it with another email program, such as Windows Mail.